It gives a wonderful experience to the wildlife buffs and nature lovers, who are keen to explore the surroundings of this majestic woodland, inhabiting animals like tigers, Nilgai, Sambar, hyena, sloth bear, and crocodile. This park was named after Madho Rao Scindia, the Maharaja of Gwalior from the Scindia Dynasty of the Marathas. It was declared as national park in 1958. 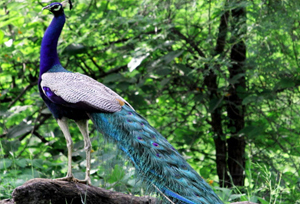 A lot of tourists visit this captivating forest area to discover its flora and fauna and to see the sights of amazing monuments, that once belonged to the royals of Gwalior. Madhav National Park is a combination of dry deciduous & dry thorn forests that make home for different variety of antelopes like Nilgai, Chinkara, and Deer, and carnivours such as leopard, wolf, jackal, fox, wild pig, etc. Its unusual terrain of hills, dry, mixed forests, grasslands, and lakes, makes it a perfect destination for sighting a variety of wildlife, especially avian species. The Sakhya and Madhav Sagar lake, located in the center of the forest, support a rich variety of migratory birds including geese, pochard, pintail, teal, mallard, and gadwall. These lakes are great nesting ground for birds and marsh crocodiles, that can be spotted here in abundance. 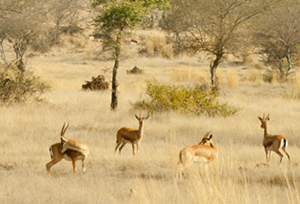 The varied landscape of forested hills and flat grasslands, makes this park a unique place to spot a rich variety of avian species, mammals, and other wild animals. Some of the prominent flora of this park includes Dhawda, Palash, Khair, Kerdhai, and Salai. 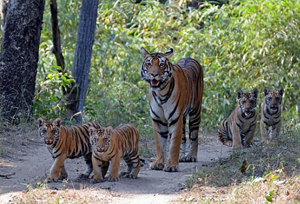 Madhav National Park offers tourists wide opportunities to sight popular animals like tiger, leopard, striped hyenas, common langur, blackbuck, jackals, sambhars, nilgai, and sloth bears. Madhav National Park also offers a rich variety of Avifauna or bird species like white-breasted kingfisher, purple sunbird, migratory geese oriole, pochard, pintail, white ibis, cormorant, painted stock, red-wattled lapwing, large pied wagtail, laggar falcon, Indian pond heron mallard, Asian paradise flycatcher, and gadwall. George Castle: This beautiful castle was built by Jivaji Rao Scindia in 1911 for British King George V, to make arrangements for his stay in the jungle. Though, he never stayed here, but this spot was widely used by members of the British Army and Royal families as a shelter spot while on a hunting expedition. The castle is built at a height in the center of the jungle and offers refreshing views of the lake, especially during the sunset and sunrise. Sakhya Sagar Lake & Sailing Club: Tourists can enjoy boating in this lake and experience bird watching while riding through the water, surrounded by exotic flora. This lake is an important biodiversity support system, which provides a rich habitat to a variety of reptiles & birds. Some of the important reptile species that can be spotted here are marsh or mugger crocodile, Indian python, and monitor lizard. Months between October to March is perfect to visit the Madhav National Park, which record a good population of migratory birds in winter season. Summer months are extremely hot here as the temp rises to 47° C, however winter months record fall to 3° C.